Exciting Technological Advances in Knit Night | Knit Like You Mean It. Me: The comments just keep coming in. What do I do? Just keep blogging and giving away yarn? Mr. Trask: Um…yeah. Or you could declare everyone a winner. Me: I can’t do that! We don’t have enough yarn. Mr. Trask: That can’t possibly be true. Franklin shows us the swatch for his new "Feline" pattern. It has a companion pattern, "Canine," so that (as Franklin told us) you can wear cats and dogs together. More photos in this Flickr slideshow. For those who are just joining us, I’ll be posting an FAQ on the stash giveaway later today or tomorrow (depending on how well packing goes this afternoon). Essentially, though, find yarn you want, comment on that post, and wait for the deadline to pass. You can donate to my shipping costs, but you don’t have to. The deadline on the last post is Friday at noon, so there’s still time to get yourself some nice Jamieson & Smith yarn. Scroll down on this post to see more yarn you could win, just by commenting. We leave for England on Sept. 22, so Everything Must Go (except, well, for a few skeins I’m keeping for myself). All winners are selected by the super-duper Random Number Generator. Shelter Log Cabin Blanket: Franklin Habit saw this! With his Franklin Habit eyes! The amazing surge in readership leads me to my thoughts on Google+, which I joined a few weeks ago. Here’s the thing: I thought it stood a small chance of replacing Facebook, and it’s not going to do that for me. Too few of my friends are on it, and I believe Facebook’s got a major advantage still in its wealth of distractions (Lexulous, anyone?). Where G+ is really taking off for me is in its ability to connect me with people I don’t know. On Facebook, I post more personal information, more photos, etc. I’ve never really been comfortable with friending many people I don’t know there. On Ravelry, I am, but since Ravelry doesn’t have a news feed there isn’t that real-time conversation feel that Facebook offers. 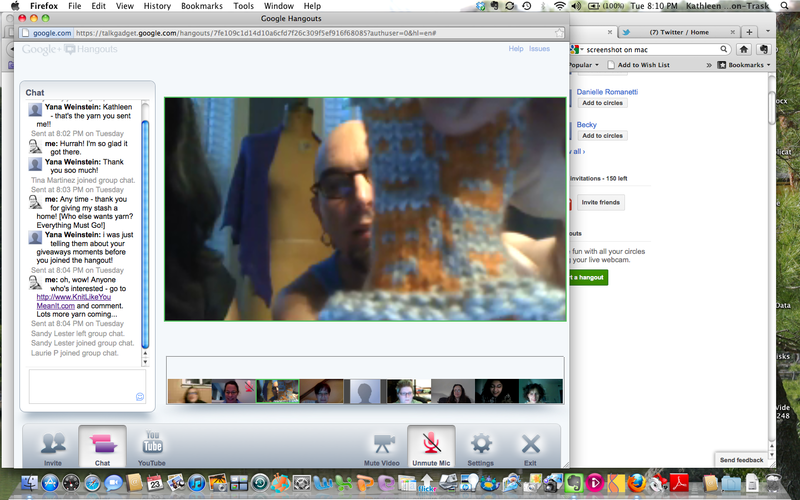 So far, G+ is giving me real-time conversation with knitters I haven’t met before, and I’m really loving that. Debbie Bliss Donegal Tweed Chunky: Recommended by Mr. Trask's neck. A lot of the connections among knitters there is due to Yana‘s efforts. She was one of the first people on G+, and she decided she wanted to create a community of knitters there. She thought carefully about how to do that, and she has already introduced many of us to one another. She’s figuring out ways we can identify other knitters through one another’s circles, and then what we can do to interact without feeling we’ve been shoved into the Wild West of the Internet. Every week, she seems to have another idea about how to get us all together (today’s idea: an exchange to finish one another’s hibernating Works-in-Progress). It’s pretty neat to see an interactive knitting community take root from the beginning – and I feel I’m seeing that more here even though I was a relatively early Ravelry beta tester. Some of the difference has to be that the online world has changed mightily over the past few years, but some of it is just that G+ is a different animal, with different priorities. Fyberspates Scrumptious Aran: Just what it sounds like. So – that’s my plug for you to try it out. It’s definitely one more social media site to cope with, and at the beginning that was a major drawback for me. But in the past few weeks, it’s started to feel different enough (in structure and in the people with whom I’m connecting) to be worth it. Add Yana to your circle if you want to keep up with her knitterly action. And, while you’re at it, add me, too! If you’d like an invitation from me to G+, just go to this link. Neighborhood Fiber Co. Sock Yarn Smorgasbord: The red and the pink probably don't go together, so don't combine those socks. I also got to show everyone what I was knitting: a blanket made of Brooklyn Tweed Shelter. Tina (who also told us all about working behind the scenes at Rhinebeck) asked me whether I’d sold a kidney to pay for the yarn, and I admitted, in Mr. Trask’s hearing, that I have been buying a few skeins of Shelter each month on the sly, to make the blanket. [Now I will have to sleep on the porch for the rest of the week. But, you know, it’s going to be cold in England!] Yana asked him which of his patterns she should knit first; he said that he’s very proud of the Sahar Stole‘s construction and its knitted-on edging, and showed us his (and now I want to make one. I can’t cast on for anything new! Help!). He also showed us the purple gorgeousness of the shawl he designed for his mother, and several other goodies. A fabulous time was had by all. You can see more photos of the chat (and little anecdotes in the captions) in my Franklin Habit G+ Hangout slideshow on Flickr. Sheep Shop Sheep One: really shows off the grain of the wood in that antique tray. Three skeins Debbie Bliss Donegal Chunky Tweed: one green, one red, one charcoal. This is crying out for some kind of striped scarf. I bought these skeins and two others at a little knitting shop in rural Pennsylvania – I wish I could remember the name. I used the other two skeins (navy blue and oatmeal-ish) to make a striped scarf for Mr. Trask. People, it is the only item I have ever knit him that he actually wears. It’s coming with us to England and everything. You, too, can make a scarf that will be worn! Imagine the glory! 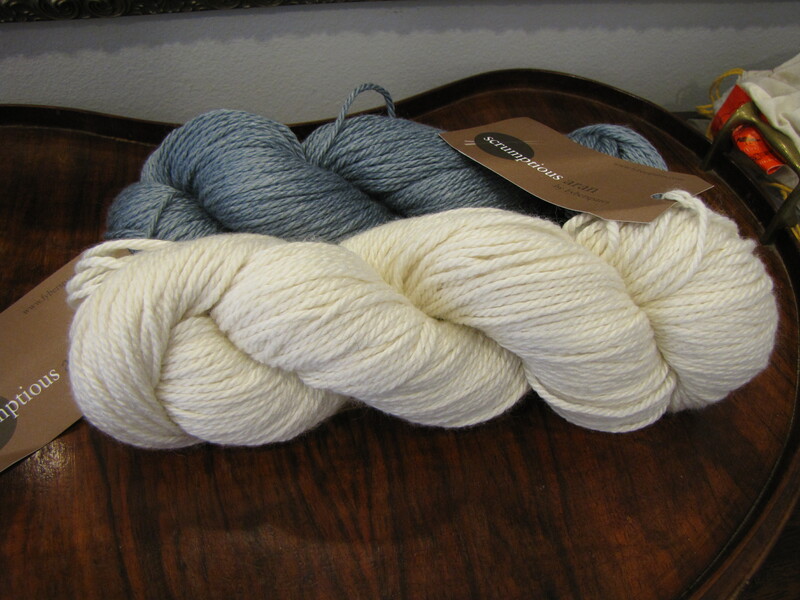 Two skeins Fyberspates Scrumptious Aran – one in Water and one in Natural. This yarn is 45% silk and 55% merino. Scrumptious, indeed. Make yourself a gorgeous lacy beret for the fall…or, heck, whatever you want to make. Why am I going all bossy today? 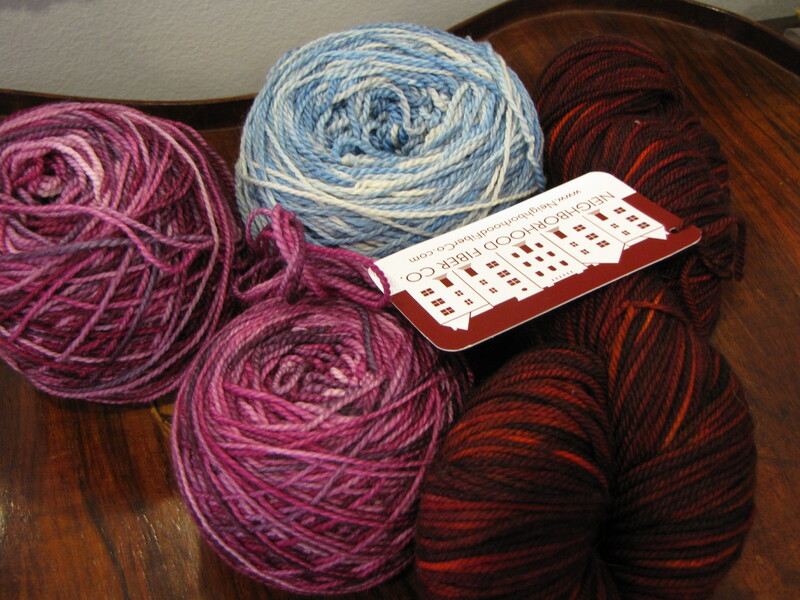 A gathering of Neighborhood Fiber Co. sock yarn: semisolid blue, pink, red. The blue is Watershed and the pink (a special edition called Hypercolor) and the red are Studio Sock. All three are yummy, yummy. 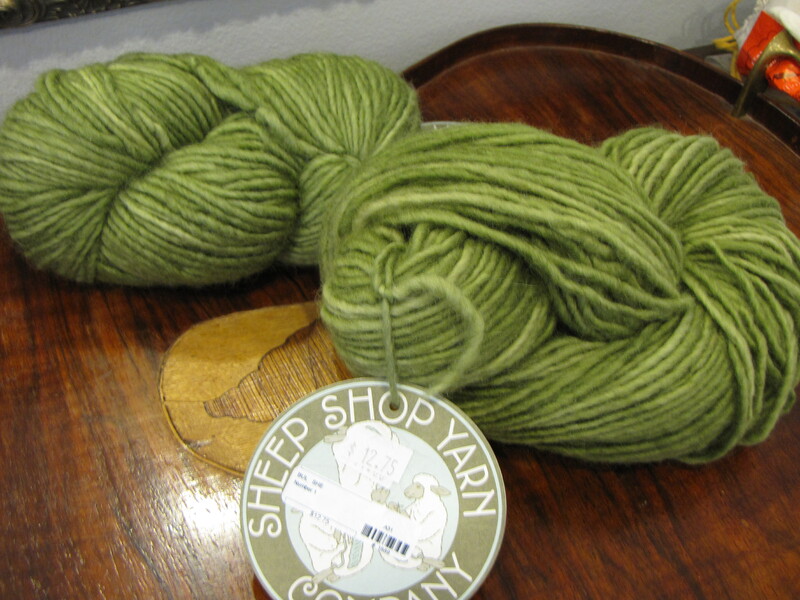 Two skeins Sheep Shop Sheep One in a purty green color. There may be a third skein around here somewhere, and if I find it I’ll include it in the parcel. This yarn is single-ply and delightfully sheepy. The usual info: yarn has been stored in airtight containers in my non-smoking, one-cat home since being purchased. Before mailing, I freeze the yarn for 24 hours. All winners are selected by the handy-dandy Random Number Generator. Comment on the blog by Monday, August 29 at noon EDT for a chance to win: what are you knitting right now? Would you knit “Feline,” “Canine,” or both? Would you ever trust someone else to finish a hibernated work in progress, or are you trustworthy to finish someone else’s? Do you want to hear about Mr. Trask’s and my transatlantic trip on the QE2 in 2003, or should we let the dead past bury its dead? What a great post! Thanks so much for your description of our knitting community on G+ – I admit I blushed a lot, you are too kind. P.S. As I’ve already won yarn, you don’t have to enter me into the giveaway – I’m just posting to say “nice blogpost” and thanks! Noooooo! Isn’t there a rule that says you can’t enter again if you’ve already won? There isn’t! Too much yarn to eliminate anyone! I love this blog. I hope I get to see some of your mismatched socks again someday. And that you have safe travels and maybe I’ll win some yarn for a new project. Warm woolen hugs! Me please for Debbie Bliss Donegal Tweed Chunky: It’s gorgeous and I would use it for the he Yarn Girls Lickety Split Sweater ( being the inpatient knitter that I am). I finished tonight an aviatrix hat for my nephew and am still working on my book cozy for my sister an inveterate journal keeper. No I would not knit canine nor feline and let the past be the past. Can’t wait to hear tales of the new adventures and travel vicarously. Wow, congrats on the Google+ success – I admit, I find it kind of intimidating, in the way that I imagine my Gram finds all things computer-related intimidating. But your post has shown me that perhaps it’s worth diving in to. P.S. – you’re right, that Sheep Shop Sheep One sure is purty! I can’t believe you’re still at giving away yarn! I think I’m trustworthy enough to finish someone’s UFO but I don’t know if I’d want someone to finish one of mine. Not sure if that makes me a skeptic or what. Weird. Interesting about G+ – the exact opposite of me a long-time Facebook hold-out, so for me it’s in lieu of Facebook. 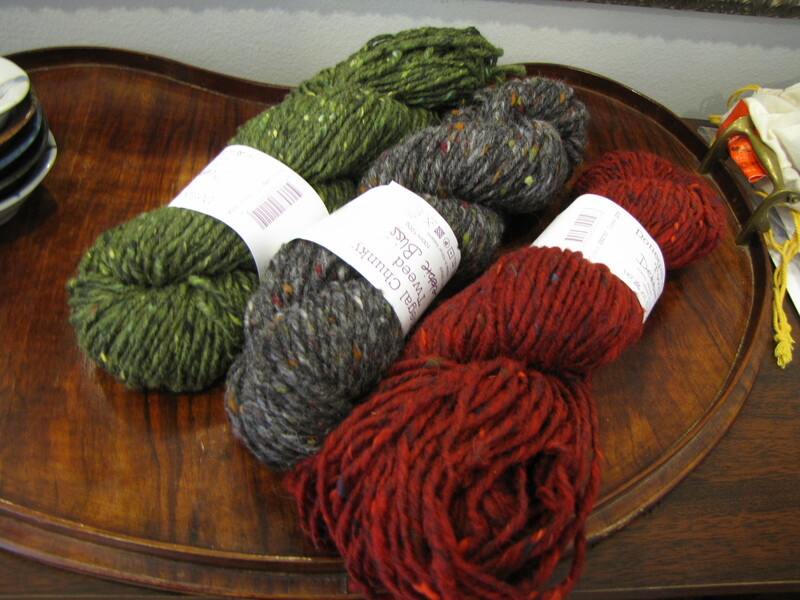 I would love some yummy Neighborhood Fiber co yarn! I think I could be trusted to finish someone elses WIP but I’m pretty sure I don’t want to! Wha? I’d never pay to be your friend!! I’d do it for free! And what is sooo special about the Brooklyn Tweed Shelter yarn? Is it spun from actual gold? And yay on the new followers…welcome to the Cult of Kathleen! I’m trying to be a good girl and finish one of my own hibernating projects (the Peaks Island Hooded Scarf by Ysolda Teague). I don’t know if I’d give one of my UFOs to someone to finish, it would feel weird, kinda like giving away your kids to be raised by someone else (way to be dramatic, I know…). Uh, anyway, love the Fyberspates! And good luck for your big move! I’m knitting a market bag as a gift for a friend. Please write about your transatlantic trip. I’m sure it’ll be a blast, and fun for us all to read about. At this point I dont know that I would let someone finish a WIP because for me its more about the doing than having something finished (although that is nice). I would also say that I am not trustworthy enough to finish someone elses project yet. I would love to hear about the trip. I am ecstatic to have run across one of your tweets bc it led me to your blog, which I have subscribed to & loving. Looking forward to some spare time so I can read some of your older posts and figure out why you’re moving to England. I am also now on G+. and have entered my info into the knitter database. Thank you very much! You’re coming to where I live? Where will you be when? Could we meet? I am a qualified London Blue Badge guide — can I show you something? It would be an honour? That is so impressive! I would love to be shown something. We’ll be in Oxford, but traveling up to London a lot – Mr. Trask will be attached to a law firm there. Fun! Perhaps you could even show me…your local yarn shop. Social networking sites contribute to a lot to how knitters interact and learn. If not for Ravelry (which I consider as a type of social networking site), I would have never met all the local knitters. As to your question, I would never trust someone to finish my WIP. Over my dead body! Oh, my… I’m liking ALL your yarn in this post! Whether it’s the great color (Sheep Shop) or the fact that I’ve used the yarn before and love it (Fyberspates & Neighborhood Fiber Co.), so I’d be happy to give any of it a new home. Love trying to come up with projects to suit a yarn! I am on G+ but haven’t really explored much. I’ll friend you and Yana today and try to explore a bit to figure out how to connect with other knitters. Can’t believe I’ve won something, Malabrigo no less, one of my top favorites – thank you so much! 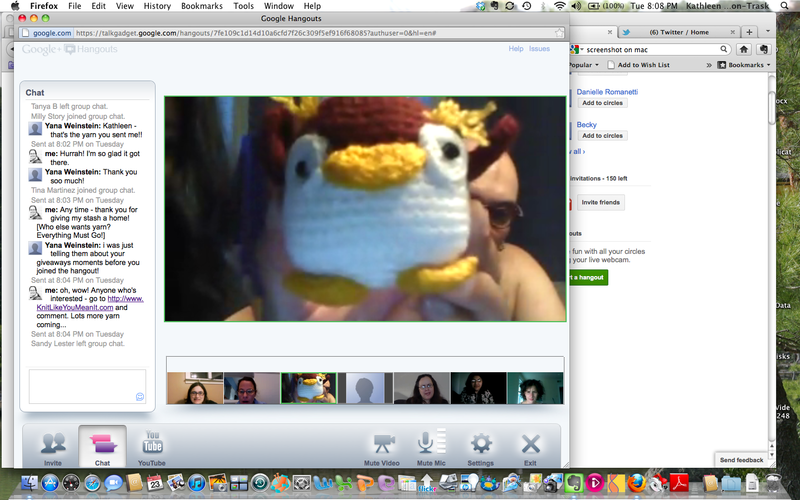 As for Google+, your video “knit night” is definitely the coolest usage I’ve seen so far. I was an early adopter, because I’m a computer geek – I just hadn’t seen anything this genuinely fun looking! BWA ha ha. I think you have put your finger on what feels so uncomfortable to give away one’s WsIP. I had to farm out some test knitting on a few of my designs over this past year – that was uncomfortable enough! I might be willing to give away some of my truly cursed WsIP, though. Does this make me a bad person? What do you do with your WIPs that make the akin to underwear??? LOL! oops, so many typos in that comment. “makes them akin to”… is what it should say. This is why I love Google+: the ability to edit comments!! Heh heh. I guess they seem like a very personal part of one’s experience. Also, they have all my mistakes in them. Why would I show those to someone else?? Hi it was nice chatting with you and all the others on Tue night,love the pics didn’t know you can snap shot when chatting.i still can’t believe your giving away yarn. Right now I’ve started my last pair of socks for Christmas, I hope the recipients will like them:) And I’m also knitting a nice white autumn scarf for myself, but I haven’t made much progress with it yet. I like the Feline pattern, but I don’t think I’d got to the trouble of actually making something that complicating for just a pair of socks. For a scarf, maybe. Thank you for the lovely Rowan! That wonderful shade will be a shock to the rest of my green-shy stash, but I know they’ll welcome it, roll around with it , form colorful little dance groupls and let it play reindeer games and everything. I’m not really anti-social (much) or anti-tech (at all), but I don’t go in for FB or the other social sites. I prefer one-on-one through blogs and emai. to the groupy-forumy-chattyboardy settings. 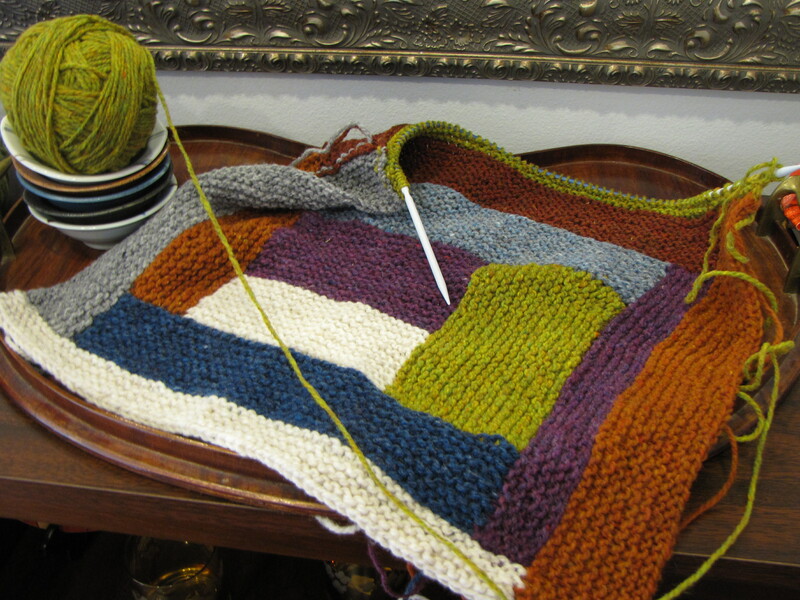 I’m working on a Spectra by Stephen West and a baby blanket, Cradle Me, as well as a few assorted smaller projects. As one of the people who found your blog through Yana on G+, I totally agree with what you said about the interactive conversations going on there. I’ve avoided social media (except for Ravelry) until now, and am really glad I joined. As far as the drawing, I’d like to be entered for the Sheep Shop or the Neighborhood Fiber Co., as I’ve never knit with either! Looking forward to reading more of your posts and hearing about your upcoming move. I’m working on a few hats for my nieces and then I’ll start one for me. I’m just starting out and really don’t have any stash. I visited my local yarn shop today and everything was so pretty and soft! I couldn’t stay long but plan to go back. Am loving being part of the G+ community of knitters. My current WIP is the G+ KAL shawl actually. Love all the yarn you have up for grabs, but am really loving the Sheep Shop Sheep One. you continue to amaze me with the yarns you give away – the sheep shop is so purty! I’m knitting BFF socks right now. I wouldn’t trust anyone to finish a hibernated WIP if there was still knitting left to do, primarily because of the chance of gauge issues. However, I’d love to find someone to do the sewing up and weaving in of ends – I like the knitting part better. Very insightful, your dialogues with Mr. Trask. It would be nice to read more about him as he is an integral part of this blog (and always entertaining). I am currently knitting a lacy scarf for a friend for Christmas and the coachella razorback for myself. I love the Tweed Chunky, but also the Fyberspates Scrumptious – sometimes it is just too hard to decide. Drool! I love the Sheepy goodness. Who can walk away from Debbie Bliss Chunky weed? Oh, there is a puddle forming at my feet. Pretty please with a cherry on top for the Sheepy Heaven?